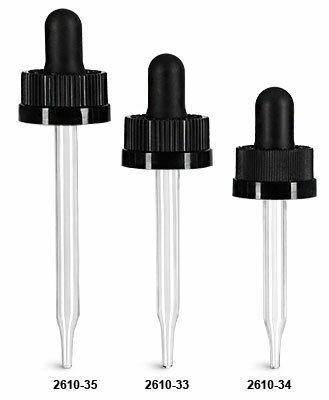 These black polypropylene closures feature rubber bulbs and glass pipettes that could be an excellent choice for dispensing many liquid products from medications to essential oils. 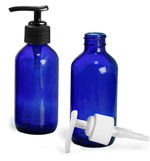 These glass droppers are child resistant making them a great option to safely house a variety of products and can be purchased in small or large quantities. This style of closure is comprised of a plastic screw cap which features a hole that houses a rubber bulb with a glass dropper tip inside. Squeeze and release the bulb to draw liquid into the glass dropper, and squeeze again to dispense the liquid.